Takanashi Yutaka (b. 1935 in Tokyo) is predominantly known as a "city photographer" engaged in recording the ever-changing urban and social landscape of Japan's capital since the mid-1960s. 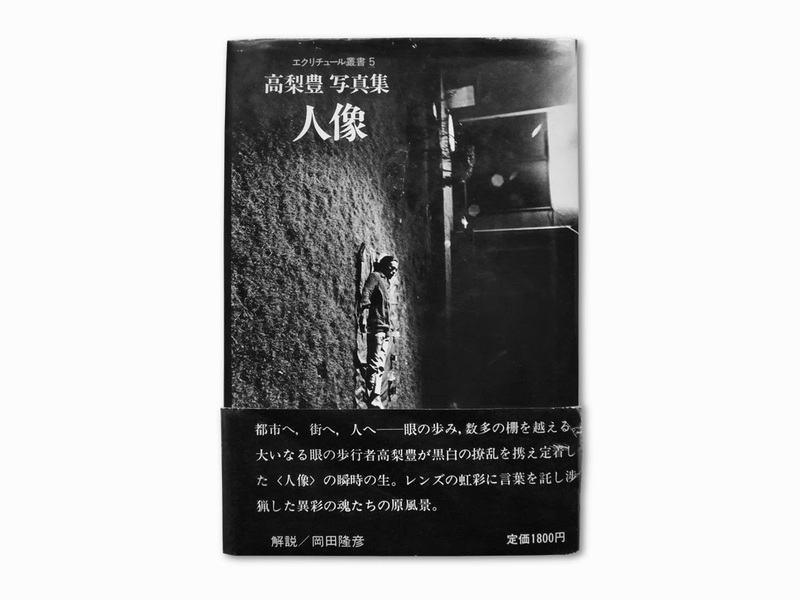 His seminal publications toshi-e (Towards the City, 1974) and the follow-up book machi (roughly translatable as town or neighborhood, 1977) are clear evidence of this pursuit. But the photographer's oeuvre up until that point also includes a number of portraits that stem from his initial activity as a commercial photographer. 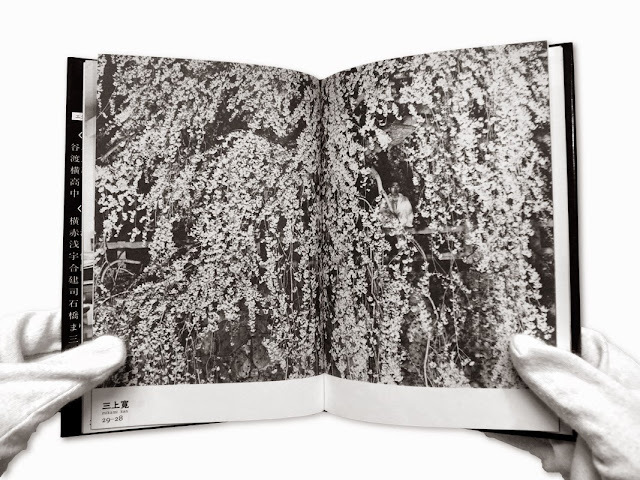 Since the early 1960s - while being employed at the Nippon Design Center - Takanashi regularly did commissional work alongside his artistic practice for such highly renowned Japanese photo magazines as Asahi Camera and Camera Mainichi. 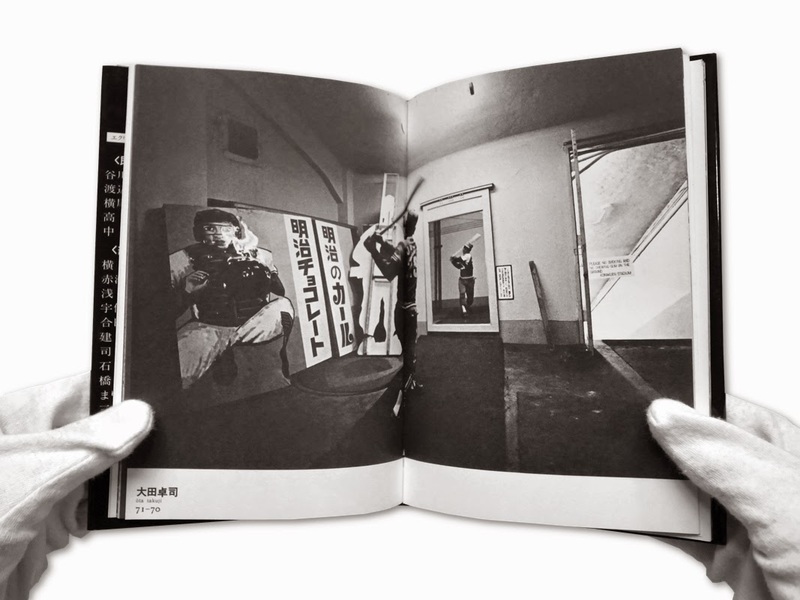 With the publication of his third photobook jinzō (Portraits) in 1979 a selection of over 60 celebrity portraits featuring actors, baseball players, writers, architects, folk singers and others - originally taken between 1968 and 1978 - was again made available to the public. The volume appeared as no. 5 in a series of books done by a wide variety of artists, writers, designers etc. entitled ekurichūru-sōsho (écriture book series). The reproduced photographs are likely to be underestimated today considering Takanashi's involvement in the short-lived yet highly influential coterie magazine Provoke at the end of the 1960s. However, upon closer examination it becomes obvious that the fair amount of quasi fashion photographs he contributed for the quarterly's issues no. 1-3 are actually more closely linked to the images collected in jinzō than one would expect at first. This is safe to say not least because of the apparent use of a hand-held 35mm camera - most likely equipped with a 28mm or even a 21mm lens - both in his commercial as well as his purely artistically driven work. Takanashi had discovered his first 21mm wide-angle lens around the time he was working on tōkyō-jin and it would prove to be one of his preferred tools. The noticeable wide frame allowed him to include not only single individuals - in the case of his city-based series these were mostly anonymous passerby on the streets of Tokyo - but also a large portion of the environment these people were acting in. (1) For instance, by placing a single figure against a larger vista of Tokyo's cityscape Takanashi was able to evoke a comprehensible feeling of solitariness on the part of his subject. (2) In these photographs people are almost always at discord with the realities of the modern city. In the case of his commercial work Takanashi naturally was not able to pursue a similarly socio-critical tenor. In fact, while his working methods stayed pretty much the same his agenda was quite the opposite. As we can see on the pages of jinzō he consistently portrayed his subjects in harmony with their natural living and working environment in order to give us clues regarding the individual's profession. Accordingly, the architect Isozaki Arata (b. 1931 in Oita-City, Oita Prefecture) is shown leaning onto a drawing table while carefully observing an architectural model that sits in front of him. We have to give Takanashi credit for successfully transforming a rather predictable scene into an interesting photograph. By using a low angle shot on a level with the paper model he created an attractive composition that is dominated by a strong diagonal line running from the upper right to the lower left - cementing his subject firmly as the main subject. 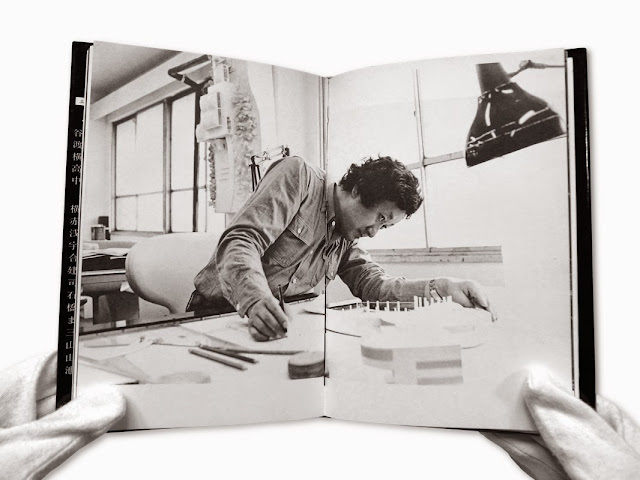 Interestingly enough, as a result of the lowered viewpoint Isozaki's body also appears slightly oversized in proportion to the small-scale building before him; possibly an allusion to the topos of the architect as creator. In another image Takanashi chose to depict Isozaki as a small shadowy figure standing in the background of a fashionable interior space. 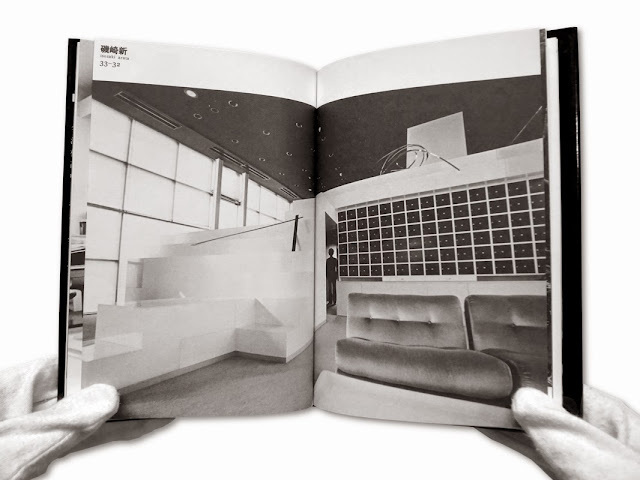 By placing him along the vertical central axis of the composition - in the middle of a room he presumably designed - Takanashi once more secures the architect's above-mentioned status. Images like these are fine examples of the photographer's astute sense of proportion. When looking at them in more detail it is certainly not without reason that we begin to see the relationship between Takanashi's commercial and artistic work manifest itself. (1) Masuda, Rei: Field Notes of Light, in: id., Yutaka Takanashi. Field Notes of Light, Exhibition.-Cat., Tokyo, The National Museum of Modern Art, 20. January – 8. March 2009, Tokyo 2009, pp. 144-149: 144. (2) Brüggemann, Ferdinand: Towards the City, in: Yutaka Takanashi, Exhibition.-Cat., Paris, Fondation Henri Cartier-Bresson, 10. May – 29. July 2012, Paris 2012, pp. 23-30: 23.